ProcSys offers a range of innovative, re-useable reference designs that include , software, FPGA cores and hardware platforms to help customers reduce the product development risks and achieve a fast "time-to-market". Our reference designs & pre-built platforms can be used as the starting point for further customization to meet your unique product requirements. 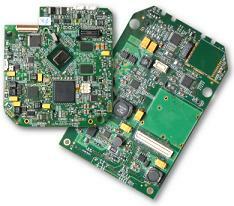 Each reference design has been cost /resource optimized, implemented and verified for functionally & robustness. This approach enables you accelerate the design cycle while at the same time reducing your development risks. Some of these reference designs are also available as evaluation platforms, so you can start your software development early in the design cycle and ensure the platform provides the optimum solution for your product. The E6xx platform is a customizable, production-ready reference platforms based on the Intel® Atom E6xx series of processors. The platform is targeted at low-power, high-performance, portable, embedded applications. The Z5xx Platform is a customizable, production-ready Intel® Architecture platform based on the Intel® Atom Z5xx series of processors. The platform is targeted at low-power, embedded applications.. This platform is based on the Intel E7520/6300ESB chipset. It has been designed to support a range of Embedded Intel Architecture processors: Celeron M / Pentium M / Core Duo / Core2 Duo / Xeon. This flexible compute capability can be coupled with the on-board FPGA based hardware application acceleration to optimally meet your embedded application processing requirements. The platform provides superior memory and IO performance and is designed to be packaged in a slim 1U rack mount or desktop form-factor. Typical applications are distributed network management, multi-service platforms, media center/server & high-end NAS (with RAID). Evaluation platforms (Celeron M/Pentium M) are available. This reference design is targeted for DSP and other embedded compute intensive applications. It leverages the compute performance of the massively parallel Storm-1 stream processing SoC with up to 160 GMACs. This platform can used to implement demanding signal processing applications at a fraction of the power, cost and effort when compared to traditional DSP and FPGA based solutions. 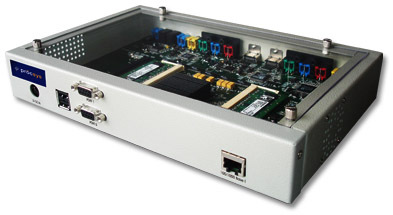 It supports a variety of Audio / Video, peripheral and expansion IO for applications like multi-channel A/V processing, video analytics, embedded graphics and other compute & data intensive applications. Based on Altera's NIOS-II soft processor, this soft FPGA IP core includes the soft processor and numerous standard peripheral interfaces like IDE, FE and VGA. Our implementation runs uCLinux and is targeted for low to medium complexity embedded control applications. Transparent Generic Framing Proceduree (GFP-T): Multi-channel ESCON/FC/GbE over SONET/SDH (OC-48) transport soft IP core (FPGA). Available as binary or net list targeted for Altera Stratix II and Xilinx Spartan 3 FPGAs. Applications include aggregation and low-latency transport of LAN and SAN traffic over SONET/SDH metro networks. 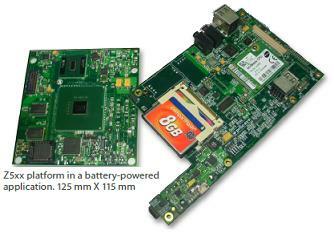 GbE: Gigabit Ethernet soft IP core targeted to Altera and Xilinx FPGAs. Available in binary, net list and source code forms. I2C: Serial interconnection plug-in soft IP for FPGAs. Click here to send us an enquiry on any service or information you need and we will get in touch with you immediately.